The two craters at the bottom of the frame are located in Mercury's giant Caloris Basin, a thousand mile wide depression formed billions of years ago when Mercury collided with a comet or asteroid. For scale, the larger of the two is about 40 miles wide. Both craters have dark rims or "halos" and the one on the left is partially filled with an unknown shiny material. Craters come in all shapes and sizes, some more bizarre than others. 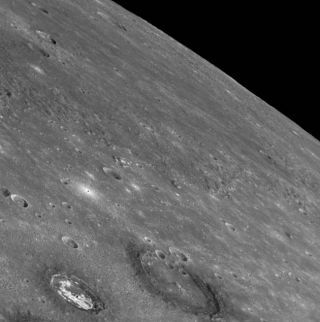 Recent photos of Mercury have revealed two new categories of crater that scientists are puzzling over how to explain. When NASA's MESSENGER spacecraft flew by the planet Jan. 14 it snapped pictures of several craters with strange dark halos and one crater with a spectacularly shiny bottom. "The halos are really exceptional," said MESSENGER science team member Clark Chapman of the Southwest Research Institute in Boulder, Colorado. "We've never seen anything like them on Mercury before and their formation is a mystery." Two of the craters are located in Mercury's giant Caloris Basin, a thousand-mile-wide depression formed billions of years ago when Mercury was struck by a comet or asteroid. The larger of the two is about 40 miles wide. Both craters have dark rims or "halos," and one is partially filled with an unknown shiny material. 1. The Layer Cake Theory: There could be a layer of dark material under the surface of Caloris Basin, resulting in chocolate-colored rims around craters that penetrate to just the right depth. If such a subterranean layer exists, however, it cannot be unique to the Basin. "We've found a number of dark halos outside of Caloris as well." 2. The Impact Glass Model: Thermal energy from the impacts melted some of Mercury's rocky surface. Perhaps molten rock splashed to the edge of the craters where it re-solidified as a dark, glassy substance. Similar "impact melts" are found around craters on Earth and the moon. If this hypothesis is correct, future astronauts on Mercury exploring the crater rims would find themselves crunching across fields of tiny glass shards. Chapman noted that the moon also has some dark haloed craters. "Tycho is a well-known example," he said. But lunar halos tend to be subtle and/or fragmentary. "The ones we see on Mercury are much more eye-catching and distinct." The difference may be gravity. Lunar gravity is low. Any dark material flying out of a crater on the moon travels a great distance, spreading out in a diffusion that can be difficult to see. The surface gravity of Mercury, on the other hand, is more than twice as strong as the moon's. On Mercury, debris can't fly as far; it lands in concentrated form closer to the impact site where it can catch the attention of the human eye. None of these explanations account for the shiny-bottomed crater. "That is an even bigger mystery," Chapman said. Superficially, the bright patch resembles an expanse of ice glistening in the sun, but that's not possible. The surface temperature of the crater at the time of the photo was around 400 degrees Celsius. Perhaps the shiny material is part of another subsurface layer, bright mixed with dark; that would be the Marbled Layer Cake Theory. "I haven't heard any really convincing explanations from our science team," he said. "We don't yet know what the material is, why it is so bright, or why it is localized in this particular crater." Fortunately, MESSENGER may have gathered the data researchers need to solve the puzzle. Spectrometers onboard the spacecraft scanned the craters during the flyby; the colors they measured should eventually reveal the minerals involved. "The data are still being calibrated and analyzed," Chapman said. If they don't solve the mystery, scientists hope MESSENGER's two upcoming flybys — one in Oct. 2008 and another in Sept. 2009 — will do the trick. Eventually, Chapmain said, "we'll get to the bottom of this mystery," and probably many more mysteries yet to be revealed.